The Union of General Cooperatives (UGC) was founded five years after the nation of Mozambique gained independence from Portugal in 1975. The 14-year war against the colonial power had left the country devastated, facing problems of poverty, famine, and overpopulation in their capital city, Maputo. Almost immediately, new fighting broke out as guerilla forces from the white minority regimes in South Africa and Rhodesia attempted to topple Mozambiques new black government. Despite this instability, people began to reclaim agricultural land, and support themselves with farming. The revolutionary party that had won independence, FRELIMO, nationalized all the countrys major resources and established machambas, or collective farms. 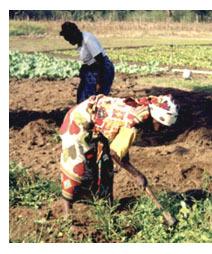 Near Maputo, independent women peasant farmers began reclaiming abandoned land to farm for themselves. They formed UGC, a highly successful cooperative organization, to purchase seeds, fertilizers, and supplies. The UGC gradually expanded its mission to include other services, such as day care, education, and legal counseling to help people gain titles to land. By 1986, the governments system of price controls and state-owned farms came to an end in the face of economic collapse. UGC adapted to these changes. Along with several other pro-democracy groups, peasant groups, and land reform organizers, UGC worked to promote the rights of peasants and women. In 1997, the Mozambican government passed a land reform act that expanded womens rights to hold land titles and made it easier for small-scale farmers and peasants to stake a claim.